Home City Wise Is Private Enterprise Good For Cincinnati’s Public Parks? Seated, standing, clinging to the walls, 200 or so bodies pack into a Clifton Recreation Center meeting room on a summer evening. They’ve come for a “community conversation” hosted by Cincinnati Parks to unveil (and gauge area residents’ reactions to) possible plans for Burnet Woods. 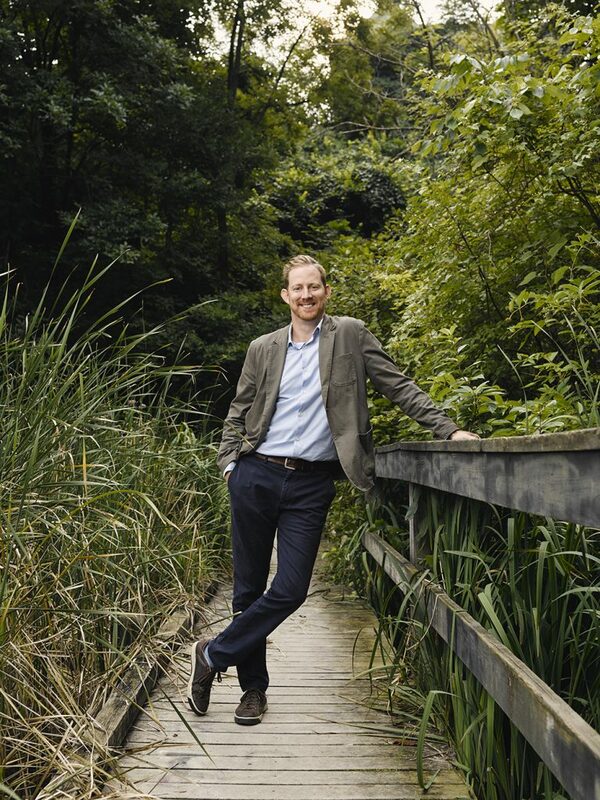 Cincinnati Parks Director Wade Walcutt photographed at Burnet Woods on August 20, 2018. There’s a set-jaw do not mess with our park vibe in the hot room intermingled with an arms-folded something needs to be done attitude that fuels civic gatherings. To smooth the waters, Walcutt tells a story. “As a young kid, when something bad happened, one of the first places I would go was the woods next door,” he says. Hunting crawdads and climbing trees gave him confidence and taught him about nature. Then those woods were bulldozed, “and that hurt.” Later, he explored woods where his father went to hunt morel mushrooms. Those woods were razed too, for a gas station. Walcutt takes over Cincinnati Parks at a contentious time. Dinged by controversy, with aging infrastructure and a shortage of funds, leadership is being forced to reexamine how these shared, unique, and irreplaceable natural resources should be cared for. But what many view as problems for Cincinnati’s parks—from tiny one-tenth of an acre Thornton Triangle to sprawling 1,500-acre Mt. Airy Forest—Walcutt prefers to see as opportunities. At the Clifton meeting, Hyde Park–based Camping & Education Foundation, which provides wilderness-focused education for young people, and the Clifton Cultural Arts Center present initial concepts that carve out space in Burnet Woods for structures and programming. Park employees take down responses at the breakout sessions following, where heated arguments lead to raised voices. Here, and at a Park Board meeting two weeks later, the feedback keeps coming. Some worry about homeless encampments in the park and that crime is on the rise; having these organizations on site, they reason, would add watchful eyes. But birdwatchers say crime isn’t a problem here and these plans threaten essential habitat for migrating Warblers and other wildlife. Others complain Burnet’s trails are run-down and choked with invasive plants; partnerships might bring needed resources to bear. What about a dog park? Still others describe the park as an oasis, saying the last thing it needs is more people and activity. Families voice their love for concerts and day camps. Ecologists want this sensitive, biodiverse preserve to be kept whole. Cincinnati parks are rated seventh best among U.S. cities by the Trust for Public Lands for amenities, access, acreage, and public and private investment. While the two proposals for Burnet Woods are, at the time of this writing, only ideas, they’re being explored because Cincinnati Parks—with an annual budget of about $9 million—faces a decades-long maintenance backlog pushing $60 million. And this groundswell of reactions shows how, while we’re fiercely protective of our parks, that protectiveness can take opposing forms. 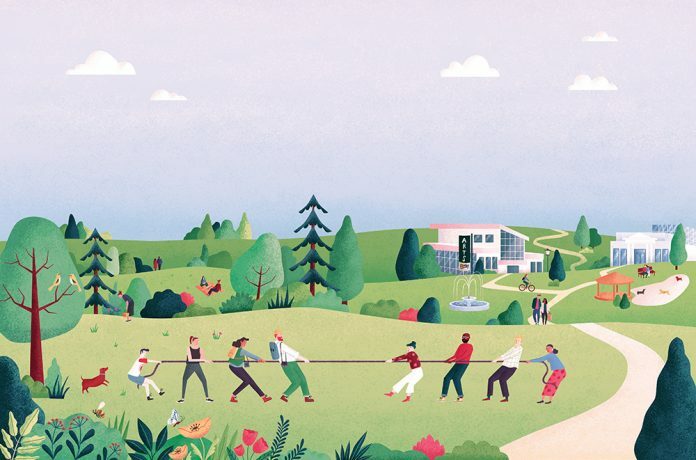 You could consider it a simple tug-of-war between the “parks are for people” folks and those of a more preservation- and conservation-oriented mind. But that sort of binary thinking doesn’t do service to the complexity of parks themselves—how they’re more than just greenspaces with trails or lawns bordered by trees. They are public spaces where the human and natural worlds meet, where the wild things are, where people appreciate wildlife and one another, and where we play, study, meditate, socialize, learn, or just relax. As Walcutt says, parks indeed provide on many levels. The extent and opulence of our parks system—rated seventh best among U.S. cities by the Trust for Public Lands for amenities, access, acreage, and public and private investment—is managed by the all-volunteer Park Board with fund-raising and advocacy support from the Cincinnati Parks Foundation, a separate entity established in 1995. Park Board commissioners are appointed by the mayor. The City Charter grants them total authority over the park system’s 6,000-plus acres (more than 10 percent of the city’s overall footprint) in an effort to insulate them from city politics and to provide them the latitude to make sound long-term decisions. That autonomy came into question following the 2015 election failure of Issue 22, a proposed charter amendment that would have levied $1 million in annual taxes to fund the parks. Even many of the parks’ staunchest advocates came out against Issue 22, citing concerns over loose language that, they claim, gave control over those tax funds to its principal backer, Mayor John Cranley, with no guarantee of public input for proposed changes to parks spending. Leading up to the vote, the Park Board contributed $200,000 to a nonprofit group campaigning for Issue 22, then took the money back when watchdog groups cried foul, claiming these funds were public and therefore not allowable as political contributions. The board maintained that the money came from a private endowment fund and was therefore legal, but withdrew it out of concern the controversy would damage Issue 22’s chances. At the same time, bonuses paid to then-Parks Director Willie Carden Jr. and Financial Manager Marijane Klug came to light, as well as questionable car allowances and other expenditures. An audit declared that Cincinnati Parks’ accounting practices were outdated and risky. And a Cincinnati Enquirer investigation discovered that the Park Board had used no-bid contracts to build John G. & Phyllis W. Smale Riverfront Park, a violation of city ordinances. Cranley and council members called for new oversight of and controls for the parks system. Intense negotiations produced a “Memorandum of Understanding” (MOU) among the Park Board, the Parks Foundation, and the city that would require the city finance director to review and sign off on Park Board contracts. Park Board Chair Dianne Rosenberg and Commissioners Robert Anning and Susan Castellini refused to sign the agreement, concerned it would strip the Park Board’s charter-mandated authority. Meanwhile, in July 2017, Walcutt was selected from a pool of 75 applicants to replace Carden upon his retirement. Walcutt immediately upgraded the park system’s financial practices and pledged transparency, which should have put the mess to rest. But then things got ugly. With Goetz in, pledging to uphold the board’s independence, a majority of Park Commissioners signed the MOU. It allows the Park Board to retain its own bank accounts but stipulates that any spending contract issued by Cincinnati Parks requires final approval by the city’s finance director to verify legality; it also prevents city officials from vetoing or “unreasonably” delaying contracts or deciding where park dollars are spent. But some worry that the MOU opens a crack in the foundation of Park Board independence, into which city officials could wedge themselves should it become politically advantageous to do so—exactly the situation the City Charter was designed to prevent. In May, commissioner Anning resigned after 23 years of service to the Park Board. He too believes that the MOU contradicts the language of both the charter and the private trusts set up for the parks’ benefit. He sent me a series of legal opinions and correspondence written over decades that, according to both state and city law, uphold the Park Board’s absolute authority over its proceeds as well as the legality of maintaining its own bank accounts. “I don’t think it augurs well for the future,” Anning says. Walcutt, 41, steps from his truck outside Trailside Nature Center in Burnet Woods. He’s tall, with ginger hair and beard, and wears a red checked tie. Originally from Zanesville, the self-described closet bird nerd studied Recreation Management at Ohio University, then worked in Columbus for both the Recreation and Parks Department and the Audubon Society. The latter included partnering with the city’s Metro Parks to build a new park on a former impound lot along the Scioto River. After three and a half years as Director of Parks and Recreation in Greensboro, North Carolina, he moved his wife and two children to Cincinnati. Spieser says the foundation’s fund-raising and advocacy have shifted in focus after a decade-long drive to develop Smale Park. It’s now taking a broader view of the system, funding conservation and programming that “activates” parks—and she sees a similar stylistic shift in philanthropy. “What we see from our emerging leaders is they like to get together,” Spieser says. “It’s a crowd-sourced model of fund-raising.” The 700-member Women’s Committee of Smale Riverfront Park that contributed millions of dollars in private funding is one example. “That kind of model is so important because, when you have a group of people that are organized and also literally planting the flowers down in the memory garden at Smale Riverfront or offering docent tours, they physically steward it along. If it’s raising money for honeysuckle removal, then they like to get out in the park to clear it.” Some donors are in it for the social aspect—you can meet a lot of people serving beer at a park concert. The foundation even runs a hiking club, which leads weekly guided forays, from strenuous to easy, through Mt. Airy Forest. From early on, Cincinnati’s parks and the benefits they provide have been their own best advocates. Nicholas Longworth begged and pleaded with city leaders in the mid-1800s to buy land of his that eventually became Eden Park. City officials called his acres unfit even for growing sauerkraut, but they eventually realized that public space was needed for both a healthy retreat from the industrial city and a reservoir for safer drinking water. There were tensions even back then between our parks’ dual roles as natural and cultural spaces. Landscape architect Adolph Strauch, who created Spring Grove Cemetery, begrudgingly included roads when he designed Eden Park because, he believed, “most people visit parks and gardens for the purpose of enjoying nature and very seldom stone and mortar.” In the 1880s, the decision to locate the new Art Museum in Eden Park was fraught with controversy. Park budgets funded concerts to accompany massive picnics and dances held in the basin of Eden Park Reservoir when it was drained biennially for cleaning. The bones of what became a true park system were laid in 1907, after park commissioners hired landscape architect George E. Kessler to draft A Park System for the City of Cincinnati. Steve Schuckman, Cincinnati Parks superintendent of planning and design, says Kessler recognized Cincinnati’s topography as a unique natural resource, designing and locating parks to complement our hills and valleys. Anticipating vehicular traffic, he connected his system with pleasant tree-lined parkways that still follow the contours of our terrain today. While war and economic contraction prevented its complete realization, much of Kessler’s vision eventually became reality through the sweat of Works Progress Administration and Civilian Conservation Corps workers—including Mt. Airy Forest, the first urban reforestation project in America. The WPA era gave our park system the look and feel we see today, Schuckman says, with rustic shelters and nature centers. Proponents of long-term planning were also major providers. Levi Ault, president of the commission that hired Kessler, donated the land that became a favorite east-side haunt. Parks Commissioner Cornelius Hauck set up perpetual funds, as did his brother, Frederick. There are too many benefactors to name, but plaques and markers illuminate a landscape quilted out of privately-funded public spirit. Nowhere is the cycle of appreciation and participation that leads to deep personal and emotional investment more evident than in Cincinnati Parks’ tradition of nature education. For more than a century, this programming doubled as a great way to ditch your kids while winning the hearts, minds, and imaginations of our young citizens—a lesson I learned on a visit to Cincinnati Parks Archives at Bettman Natural Resource Center, one of six nature centers across the city. There, Explore Nature! Program Assistant Manager Erin Morris told me how nature education was pioneered by the first naturalists hired by the parks, sisters Hester and Bernice Stephenson. They laid out nature trails that meander through our parks today and used Burnet’s Trailside Nature Center as a home for programming, Morris says, to fill a clear need while parents supported WWII efforts. “Every single kid that came to the center got to hike, play games, and be outside,” she says. Volunteer Parks Librarian Vicki Newell shows me “pixies” the crafty Stephenson sisters taught kids to create out of acorns, leaves, and twigs, an activity that addressed concerns at the time that American children were lagging behind other countries in manual dexterity. The Stephensons’ work evolved into today’s Explore Nature! program, which serves second- and third-generation participants from the same families. Campers often return to train as counselors. Nature education programming saw an outpouring of public support, Morris says, when it was threatened by shrinking park budgets in the 1990s. Community input into Cincinnati Parks goes back to the emergence of neighborhood-based groups of concerned citizens. During the 1970s and ’80s, biker gangs and unruly teens partied in Ault Park’s crumbling pavilion. Neighborhood residents organized, petitioning the Park Board to take action and raising funds. The “Friends of Ault Park” evolved into the Ault Park Advisory Council and, emulating their success, Cincinnati Parks’ Advisory Councils (CPACs) spread. There are now 19 CPACs across 26 neighborhoods communicating on a regular basis with the Park Board, a system that Walcutt credits with our parks’ unusually high level of community support. That support might sometimes be divided by differing perceptions and needs, as evidenced in Clifton, but it runs deep. We’re still standing by the lake in Burnet Woods. A branch breaks free and falls to the ground nearby. “Just a Yeti,” he says. While this approach might be a vision for the future, it ties back to parks’ primordial purpose—a dose of nature close to home that aligns our lives and spaces with the organic, living world of which we’re very much a part. Urban parks are utterly unique in that they bring natural experiences to city-locked lives. As urbanization continues, the value only increases. Parks aren’t just about quality of life or real estate—although their ability to raise the value of the latter is worth noting—but also about appreciating and supporting the natural world on which we rely for sustenance. Burnet Woods being a microcosm of the larger system, negotiations over the future of our parks will get more complex in the coming years. One of the Clifton Cultural Arts Center’s concepts suggests that additions and changes could work within the footprint of existing buildings, parking lots, and roads and, done with the comprehensive whole in mind, could theoretically reduce the amount of developed space within Burnet’s boundaries. As difficult decisions about our parks continue, transparency and truly open channels of communication matter most of all to the people to whom they belong in common. Because it’s up to us to ensure they’re made with care.